Power(s) given Walk on walls, speeds up. 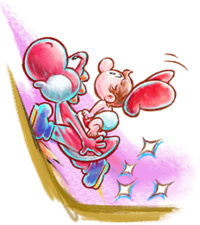 Super Yoshi is a form found in Yoshi's New Island. When a Yoshi collects a Yoshi Star, he turns into Super Yoshi and is able to walk on walls for a short time and speed up, similar to the Super Star from the previous games. If Yoshi collects a red Yoshi Star, he gets the power to blast through enemies and walls. The effect wears off after a short while, though Yoshi can maintain the form by collecting more Yoshi Stars. Super Yoshi's theme is an arrangement of Superstar Mario's theme from Super Mario World 2: Yoshi's Island. This page was last edited on October 1, 2018, at 23:19.